He remembered coming back from the war. He remembered chasing butterflies. He remembered eating the most delicious cheesecake. He did not remember the U.S., though. His partner knew that that would be a bigger war once he would come back. He was right. Ian was sitting apathetically in a folding chair unfolding his thoughts to places only available to him. It’s a weird thing not being able to travel at the same time to the exact places with your loved one, thought Gabriel. Last year they had so much fun in winter. All the snowmen, snow angels, the decorations on the Christmas tree… Mind you, it was not even an evergreen that one sees aligned like unidentified soldiers’ bodies on a fucked up battlefield. No, they had to unearth their beloved, dying elm from their garden. They wrapped it in gauze and tin foil: a vibrant tree once, then ailing, now dead. It was placed in their bedroom. That was where Ian requested the tree to be placed. They made a promise that night: once departed for war, they would not write to each other. They would wait. And upon return, they would embrace each other, silently, remove the dead tree from their bedroom, bury it, and then go on with their lives. Not ever looking back. Ian is silent. Wrapped in awful nightmares, the residues of war… with a bunch of decorations, which he said he would melt into one gigantesque and grotesque piece—a synecdoche for war, he said. Gabriel brought him tea with a touch of cinnamon. They always drank that in October, prepare for Halloween, and let summer slowly slip away off of their bodies. This year, though, Ian cannot understand Halloween. Gabriel brings a catalogue that was recently dropped in their mailbox. Ian only gestures in disgust. He did not even touch his tea. He said it was the worst combination possible. “Why do people get dressed like freaks?” “It’s fun…” “Cretins!” “Oh, come one. Do not get that excited. It’s a silly tradition. Year-around we wear the same clothes, or should I say uniforms? That’s idiotic!” No one said anything else. Silence broke the walls. They went to bed without eating. It’s November: Ian still does not remember the U.S. Only the day before, he got infuriated inside their local grocery store when he saw all the people putting a huge bird in their cart. “But this is what people eat on Thanksgiving! Stop with this nonsense! People are not going to eat only cranberry sauce and gravy because you… have a phase, or whatever this is.” Ian did not say a word. He stormed out of the store. At wintertime, the scenario repeated. The worst was on Valentine’s Day: the hearts, the cheap love messages, and the stuffed teddy bears… “I cannot live like this like a product.” Over the span of this unusual exposure to iconic American binging sale moments, Gabriel agreed with Ian’s particular amnesia. But he did not have a chance to tell him that. On Sunday God was smoking pot. He said he had tried his best and failed. Adam could not have a companion. If he felt lonely, he should try to see how hard the process really was. After all, God reasoned, there was never a companion for him either. He had to do all the things by himself. In retrospect, was that the best decision? But who could judge God? Is there a higher entity than Him? For several months, Adam did not care he was alone in Paradise. He was discovering his surroundings and he was making notes on leaves. There were so many, that at one point, jokingly, he nicknamed it the “tree of knowledge.” Everything was full of life and color. But there were no objects. Back then it has just Adam and nature. It looked serene, completely out-of-this-world. God said Adam was lucky. He just finished a huge art project for the celestial annual festival and he had plenty of tin foil left. He said it would make Adam a companion. Adams pulled out a rib. He wanted to make God shut up once and for all. Oh, my… Oh, my. The ugly truth unleashed its odor. Adam discovered that that was not a rib but something made out of clay. He pulled out one after another, as if he was in a frenzy. Clay, clay, more clay! In fact, only clay. Adam the man realized he had always been Adam the pot, Adam the object. When he was ready to pull out his final rib, God got a grip of Adam and yelled: “Stop it! NOW! Leave that rib to me. With this tin foil and that clay rib I will make you the most beautiful companion.” Adam wanted to talk. “Do not fight with me. There is no reason to start a fight when you will lose. Wait. Or go to sleep. Yes, do that.” When Adam woke up, next to him, there was a tiny creature. He named her Eve. E for everlasting, V for voice, and E for ending. EVERLASTING.VOICE. ENDING. Without any ribs, Adam woke up so he could die or give birth to Eve. The ultimate sacrifice. Eve was now lonely in Paradise. Of course, she had no idea where she was. She found the notes all scattered on the ground and the tree of knowledge stripped off of everything. She laughed. She finally realized what she was supposed to do there: laugh. She made planes out of those leaves. Leaves-planes. “What’s the point of living if one is alone?” I’d rather fly and see everything from a distance. Eve has been circling around since then. Leaves-planes are seen every now and then and elders nod their heads knowingly. Actually, if I am not mistaken, these special planes are still circling up above. Lift your head to see for yourselves. 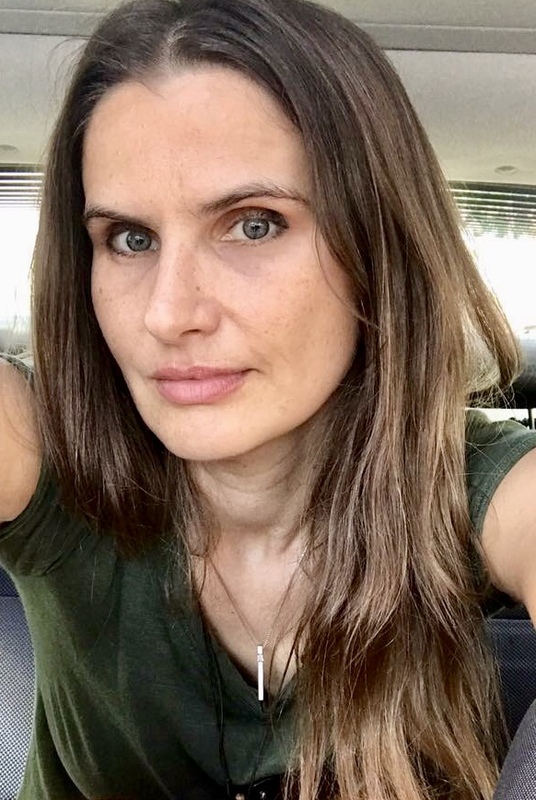 Catalina Florina Florescu earned my Bachelor’s Degree from U of Bucharest, Romanian Literature (major), American Literature (minor); she holds a Master’s Degree and a PhD in Comparative Literature from Purdue U (specializations: Comparative Theatre & Medical Humanities). At Pace University in New York City, she teaches learning community, honors courses in literature, cultural studies, cinema, and writing. She is also an author whose books are in permanent libraries worldwide as well as at the Library of Congress in Washington, D.C.: Transacting Sites of the Liminal Bodily Spaces (literary criticism; medical humanities); Disjointed Perspectives on Motherhood (mothers in literature & motion picture; feminist criticism); Inventing Me/Exerciţii de retrăit (memoir). Her last book, Transnational Narratives in Englishes of Exile (cultural and literary criticism; immigration; Englishes and plurality; diversity & diaspora studies), was exhibited at the MLA convention in NYC and followed by a book launch at the U of Chicago. 2017 also marked her debut in poetry with a volume titled, The Night I Burned My Origami Skin, from which she read at this year AWP’s annual convention in Tampa. Her next goal is to see her plays performed both here and in Romania. “Mia” (drama); “The After/Tastes of Life” (farce); and “Suicidal Dog and Laika” (political parable). The Romanian version of the plays has just been published by the publishing house Tracus Arte based in Bucharest. The English version will be published later this fall by PalmArtPress, based in Berlin. With “Mia,” Dr. Florescu had a reading at the Romanian Cultural institute in NYC and was also a guest speaker at Harvard University. With “Suicidal Dog & Laika” a staged reading at TheaterLab in NYC, a reading directed by Marcy Arlin, Artistic Director of The Immigrants’ Theatre Project. With the Romanian version of “The After/Tastes of Life” she had a reading at the Museum of Romanian Literature in Bucharest. With “Mia,” Dr. Florescu will have a talk at the prestigious international theater festival SibFest ‘18. Dr. Florescu is currently working on a volume of short stories titled “Not/Yet.” She presented at New York University, Harvard University, Sorbonne University, University of Bucharest, etc.